It seems, perhaps as a result of the growth of the social media and advertising industries, that data is an increasingly valuable resource. In the same vein as projects like Brave with the Basic Attention Token, Streamr aims to return control back to its users, by allowing them to sell it however they see fit. CryptoSlate spoke with Henri Pihkala, the founder and CEO of Streamr, to better understand the network he hopes to build. Matt Breen: How would you sell someone on the platform? Henri Pihkala is the CEO and Founder of Streamr, a decentralized data marketplace. Henry Pihkala: You, your phone, your car, your home, the apps you use, the company you run, the city you live in – everything around you is constantly producing streams of real-time data. How much revenue are you earning from that data? Zero, you say? We want that changed. A decentralised marketplace and a scalable messaging network enable people, organisations, and machines to easily trade data – whether it’s raw data from sensors and apps, or the output of a value-adding algorithm. Traditionally, companies keep data in silos because it’s easier and less risky than sharing it. They struggle to apply the latest analytics to squeeze out the last drop of value internally, overlooking the potential external customer base as well as the wisdom of crowds. Even if companies tried to monetise the data, there are significant overheads: setting up APIs, tricky handling of credit card details, and attracting customers to their special little silo. Streamr aims to be the Ebay of data streams: an access point for all the real-time data in the world. MB: Let’s pretend that IOTA actually works as intended. How is Streamr superior? IOTA aims to do micropayments, while Streamr does massively scalable low latency publish-and-subscribe messaging and NO payments. Instead, we use an accompanying blockchain for payments, identity, and a few other things in order to avoid reinventing the wheel. Consider wallets, for example. Streamr will work with any Ethereum wallet in the world. That’s a nice perk. IOTA aims to build a self-sufficient system, while Streamr plays ball with others. We aim to work in tandem with current and future smart contract ecosystems – first Ethereum, but later perhaps NEO, RSK, even Hyperledger, or whatever becomes popular down the road. Some layers of the Streamr system could even interact with IOTA! IOTA is focused on being useful for the emerging machine-to-machine (m2m) economy of the Internet-of-Things (IoT), data integrity and micro payments. We love what the IOTA guys are trying to do, and neither approach is clearly superior. If the underlying idea of tokenising data takes off, the market will be huge enough to fit five IOTAs and five Streamrs. It’s not a winner-takes-all market, because there are a multitude of blockchain ecosystems to server, various data niches, and different technical requirements for different use cases. The openness of decentralised ecosystems promotes interoperability, and for data producers the overhead for selling their data on multiple marketplaces is extremely low. They will want all the channels they can get. In addition to the “official” marketplaces, there will probably even be a multitude of niche marketplaces that others build on top of both Streamr and IOTA. In a decentralised network, anyone can set up a marketplace. MB: What sort of use cases would you like to see? HP: Personally I’m quite interested in data refinement chains: One participant makes available, say, social media data about a major S&P 500 company. Another participant buys that data, applies their sentiment analysis algorithm, and sells the output as another streamed product. Yet another participant buys that data, combines it with stock market data for that company and sells trading signals. Traders buy a variety of signals and use them as inputs for their trading algorithms. This kind of freely evolving economies of data can lead to significant sophistication of data because it taps into the intelligence of the crowd. I would also like to see the use of personal real-time data evolve. For example, currently large companies such as Google and Facebook gather every piece of information they possibly can about us for free, and then sell it to advertisers. This data is inaccurate and out of my control. I’d rather voluntarily provide excellent-quality, timely information about myself and my whereabouts, be in control of who gets it, and collect the rewards myself. MB: It’s 2027. What does the platform look like? And what Ethereum projects have stood the test of time? HP: In 2027, Streamr is one of the core building blocks of modern apps: the real-time data pipeline of the decentralised web. Application developers have migrated from cloud platforms to superior decentralised services, such as computation containers (e.g. Golem), file storage (IPFS, Swarm), decentralised databases, and decentralised data pipelines such as Streamr. Data-driven decentralised apps and microservices can easily be built and deployed using a future version of the Streamr tooling, a predecessor of which is available today as the Streamr Editor and Engine. The Streamr Marketplace is a view into broadly useful content in the Streamr Network, including data from all business verticals such as finance, social media, IoT, smart cities, transport, health, and personal measurement. In the decentralised middleware space (which in my view includes Streamr, all blockchains, Golem, and many others), survivors will be the projects that unlock new business models and inspiringly cater that possibility to their communities. Middleware can only succeed if its users are able to succeed in building the actual end-user apps and real-world use cases. Streamr is a decentralized network for data to app delivery. It allows the publishing of new data to data streams. MB: Who’s the target audience? HP: The easiest wins are available for companies already producing and selling data or data services, such as device manufacturers, analytics companies, financial marketplaces, satellite operators, and so on. Currently they are doing it from within their silo because there is no other way, meaning they set up and manage their own delivery and payment infrastructure. For them it’s a no-brainer to open a new sales channel which is easy to onboard, plus these companies don’t need to be convinced that data sharing and monetisation are an opportunity because it already is at the core of their business model. MB: Have you forged any partnerships with other projects or businesses? HP: Sure! We have an official R&D partnership with Golem, as we are building complementary technologies which can become major building blocks of the future application development stack. We are also highly interested in decentralised computation, because it will benefit the Streamr Engine component of our stack. Of course we’re less than 100 days old but already we’ve got lots of companies, big and small, from several continents knocking at our door to talk about various use cases for the Streamr Network as well as about becoming participants in the Streamr Marketplace. One of those companies we’ve already announced is Zipper who are trying to put the blockchain on people’s phones. The process with blue chip companies is naturally slower. We’ll keep announcing interesting partnerships and pilots as they turn into something concrete. MB: What does the roadmap look like at the moment? 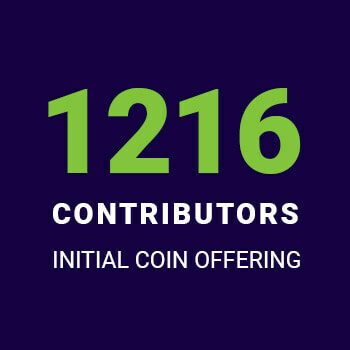 Streamr raised 36,432 ETH from 1216 contributors during its initial coin offering. HP: We successfully funded the project in late October 2017, so we are in a rapidly accelerating phase. We have a centralised subset of the system up and running. It will be expanded and iteratively decentralised in various stages over the course of the project. A centralised starting point allows us to have a working system up and running from day one, which helps in building a community. Our roadmap is divided into three milestones, which consist of work packages related to the different components of the overall system. In 2017 we worked mostly on the Engine and Editor, which are the most interactive parts of the system. They are easy to show to people, and nicely lower the threshold of adoption. Currently we are working on the marketplace. In this recent update, I said we’ll have a functioning marketplace by the end of this year. Not just a prototype, but one that is actually being used to buy and sell data streams. Keep up with Streamr on their website, Twitter and Rocket Chat. I’d highly recommend checking out their tutorial for a feel of how the Engine will work. You can also check out this 2 minute explainer video for a quick overview of how Streamr works. Matt Breen is a recent law graduate and crypto journalist, as well as a strong proponent of hyperbitcoinisation.